UPDATE July 30, 5:10 p.m. This statement by Rep. Drazkowski is in direct conflict with Omar’s statement that she was unaware of the Minnesota House rules prior to her paid speaking engagements. 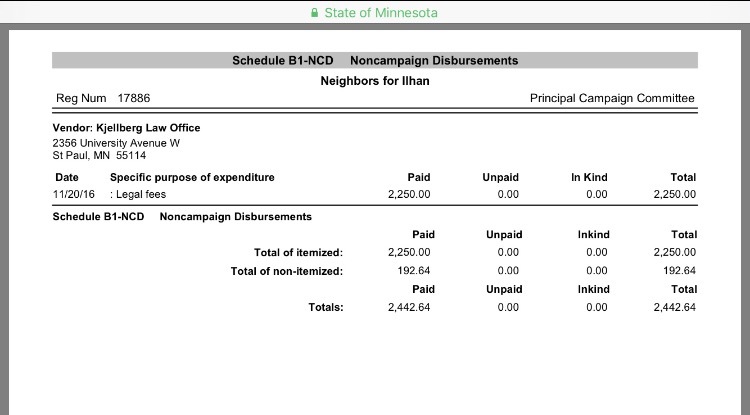 Minnesota State Representative Ilhan Omar (DFL-60B) accepted payments from Minnesota State Colleges and Universities (MNSCU) last year, which is a violation of Minnesota House Rules according to Minnesota State Representative Steve Drazkowski (R-Mazeppa), who spoke early Monday in a press conference. Drazkowski calls Omar’s behavior “unethical and unbecoming” of a state representative serving on the Higher Education and Finance Committee. The information in the late-filed statement revealed that Omar was paid $2,000 to serve as a keynote speaker at Normandale Community College at an event held on February 28, 2017. On April 19, 2017, Omar was paid $500 to deliver a keynote speech at an Inver Hills Community College event. Rep. Drazkowski states Omar clearly violated rules that are in place to prevent a house member from receiving payment from an organization that has business before the legislature. Drazkowski referenced Minnesota House Rule 9.20 which states, “Acceptance of an Honorarium by a Member: A member must not accept an honorarium for a service performed for an individual or organization that has a direct interest in the business of the House, including, but not limited to, a registered lobbyist or an organization a lobbyist represents.” Ironically, Omar voted to adopt the Permanent Rules of the Minnesota House, which includes House Rule 9.20 just 12 days before her first paid speaking engagement at MNSCU. “Representative Omar’s willingness to accept money from institutions that are dependent on her committee and vote for their funding is the textbook definition of unethical,” Drazkowski said in a statement. “Because of her decision to withhold disclosing this information until after the Legislature adjourned sine die, we are unable to formally file ethics charges against her.” In addition to serving on the Higher Education and Career Readiness Policy and Finance Committee, Omar also serves on the Civil Law and Data Practices Policy and State Government Finance committees and is in a house leadership position serving as an assistant minority leader. Drazkowski stated that if the ethics committee were to find Omar in violation of House Rule 9.20, the end result would be to demand her to return the payments. “With that in mind, Representative Omar needs to return these payments to the MNSCU campuses immediately,” he said. 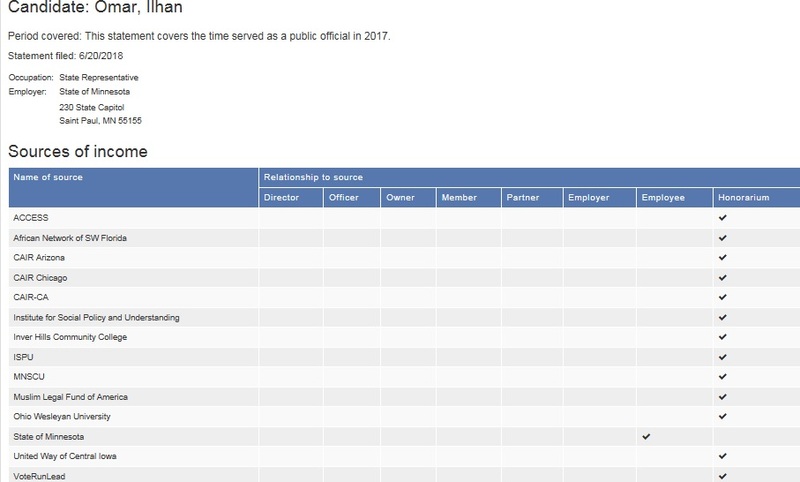 Further examination of Omar’s Financial Disclosure report shows Midwest Reliable Transportation, LLC – a Non-Emergency Medical Transportation (NEMT) company run by Omar’s “cultural” husband Ahmed Hirsi receiving a total of $18,022 over the past two years from unspecified sources. Once elected into the Minnesota House of Representatives she continued to stir up controversy. Omar voted against a measure that would allow insurance companies to deny payouts to families of terrorists. She was one of only two Minnesota representatives to vote against this measure. Rep. John Lesch (D-St. Paul) was the other no vote. He justified his vote by saying he was against the bill because it allowed an insurance company – not a court – to decide what constitutes an act of terrorism under the statute and said the bill needed to be more specific to be effective. 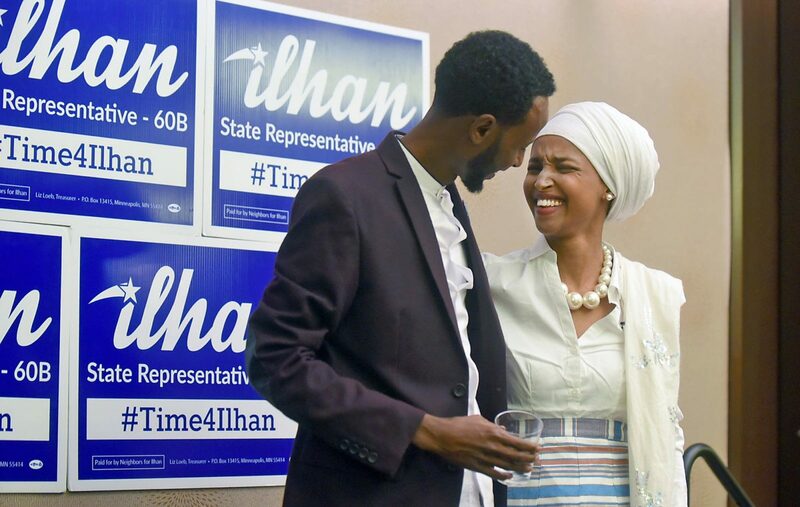 In June 2018, Omar filed to run for the seat held by Rep. Keith Ellison, in Minnesota’s fifth congressional district and was endorsed by the DFL later in the month. With so many unanswered questions regarding her campaign finances, her financial disclosure reports, her marriages and why she would vote to allow insurance companies to pay families of terrorists makes one think if Omar is running for United States Congress to help America or to transform it into her own vision. The video of the press conference as well as the Deplorable Housewives viewpoint on the matter is attached below.